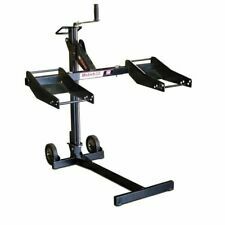 MoJack XT Lawn Mower Lift with Front load lifting capacity of 500 lbs. 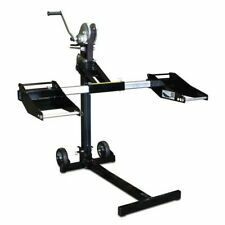 Lawn Mower Lift Pro Adjustable Wheel Pads Collapsible Steel Front Load 750 lbs. Product Type: Lift, Capacity (lbs.). : 750, Height Range (in.). : 40 x 49 x 45, Finish Type: Powder-coat, Foldable: Yes. 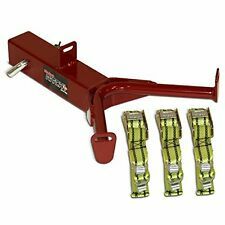 MoJack Pro Lawn Mower Lift - 750-Lb. Capacity, Model# MOJACK PRO. Manufacturer: MoJack. These wheels were never used, still new with sealer in them. With a front load lift capacity of 500 lbs. and adjustable wheel pads this lift will accommodate most residential riding lawn tractors and ZTR mowers. The MoJack HDL 500 lifts your mower up to 24 in. 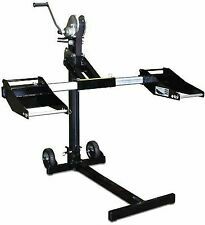 The MoJack PRO lawn mower lift has a front load lifting capacity of 750 lbs. With the MoJack PRO you can safely lift your riding lawn tractor or ZTR mower up to 28 in. high for easy access to the undercarriage. I am a Polaris dealer. We are not responsible for mis-ordered parts. 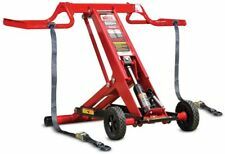 The MoJack XT has a front load lifting capacity of 500 lb. and adjustable wheel pads to accommodate almost every riding lawn tractor and zero turn radius mowers on the market. With a lifting height of 25 in. Easily transport heavy buckets on your riding mower and save your back from the strain. Quick and easy assembly. - Required to use with Multi-Use Hitch. - Great for Buckets and Pots. 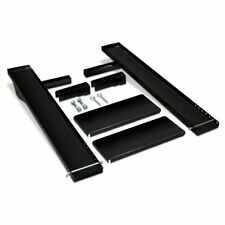 - Fast and Easy assembly. And debris removal. With a front load lift capacity of 500 lbs. and adjustable wheel pads this lift will accommodate most residential riding lawn tractors and ZTR mowers. The MoJack HDL 500 lifts your mower up to 24 in. 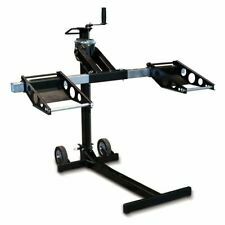 The MoJack PRO lawn mower lift has a front load lifting capacity of lbs. With the MoJack PRO you can safely lift your riding lawn tractor or ZTR mower up to in. high for easy access to the undercarriage. MoJack EZ MAX - Residential Riding Lawn Mower Lift, 450lb Lifting Capacity, Fits Most Residential and ZTR Mowers, Folds Flat for Easy Storage, Use For Mower Maintenance or Repair. It features a unique clutch system for easy lifting & automatic safety system with smooth release handle. It features a unique clutch system for easy lifting & automatic safety system with smooth release handle. The clutch system provides the right amount of torque when lifting a light or heavy duty lawn mower or tractor. Fits any lawn tractor or ZTR riding mower on the market. MoJack XT Riding Mower Jack is designed to lift any riding mower or lawn tractor on the market, including zero turning radius models. Easily raise mower with one hand or a power drill. 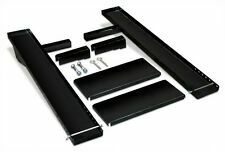 In addition, these adaptable lifts are ideal for adjusting ATVs and golf trucks. The smart plan of the MoJack XT makes it perfect for lifting any riding cutter or garden tractor available including zero turning sweep models. MoJack EZ is a smarter way to maintain your lawn mower. This lift is precisely engineered to lift most residential riding mowers and lawn tractors, including zero turning radius models. Custom designed to provide an easy way to lift and secure your mower, the MoJack EZ is adjustable to fit most residential ZTRs and lawn tractors!